Rotary car show races into Las Vegas in 2018! Visit the Las Vegas Rotary Car Show! The Las Vegas Rotary Club, the largest Rotary Club in the Las Vegas Valley, invites the public to their Third Annual “Cars for a Cause” Car Show on April 15, 2018 from 8am- 2pm at Celebrity Cars in Las Vegas, Nevada. 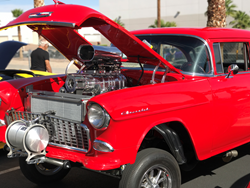 The “Cars for a Cause” Car Show benefits youth across the Las Vegas Valley. Classic, high performance and unique cars will be displayed throughout the grounds of Celebrity Cars, giving visitors the opportunity to view the region’s most wild wheels, classic cars and motorcycles. The Rotary Cars for a Cause Car Show will also offer food trucks, beverage vendors, race games, face painting, temporary tattoos, auto and motorcycle accessories along with photo opportunities. "We are thankful to again have the support of Celebrity Cars as our venue sponsor. Celebrity Cars offers a unique event space filled with exotic and classic cars - a "must see" for the car enthusiast" said Michael Gordon, President Las Vegas Rotary Club. "Our third annual car show is not only our club's largest fundraiser with lots of fun activities for young and old, it is also our window to the community where any interested party can learn more about the good work our club does in the Las Vegas community"
The show is free for visitors, and car registration is available in advance at the Las Vegas Rotary website. Valuable prizes will be awarded to participants based on a number of judging categories by local celebrity judges. The show benefits the youth of Las Vegas through the Las Vegas Rotary Foundation and selected local charities. Las Vegas Rotary Club members will be available throughout the show to guide the guests and provide information about the Rotary’s presence and service to the community. The Car Show is free for visitors and open to the public. It will be held at Celebrity Cars of Las Vegas, located at 7770 Dean Martin Dr. #301, Las Vegas, NV 89139. Show participants and sponsors are invited to register at http://www.lasvegasrotary.com or email admin(at)lasvegasrotary(dot)com. Founded in 1923, the Las Vegas Rotary is the oldest Service Club in Las Vegas, Nevada. The Club’s mission is to teach youth to succeed through literacy, education and life skills development, and Club members dedicate their time, service and fundraising to support Las Vegas valley youth in need. The club is an integral member and contributor to Rotary International and also funds many local, academic scholarships through the Las Vegas Rotary Foundation. For more information and membership opportunities, visit http://www.lasvegasrotary.com and follow us on Twitter @lasvegasrotary. Rotary brings together a global network of volunteers dedicated to tackling the world’s most pressing humanitarian challenges. Rotary connects 1.2 million members of more than 35,000 Rotary clubs in over 200 countries and regions. Their work improves lives at both the local and international levels, from helping families in need in their own communities to working toward a polio-free world. For more information, visit http://www.Rotary.org.